Solar panel enterprises are struggling? We all know that China has become a dominant player in the solar panel industry in recent years, and Chinese people are so proud of their tremendous efforts put into sustainable solar energy. I am one of those people. I even praised Suntech, located in my hometown of Wuxi in Jiangsu Province, in my college applications. However, as is always the case, when companies in China all flood into an industry, supported by government policy and funding, this so-called sustainable industry is becoming unsustainable, and figuring out how to save it has become urgent. 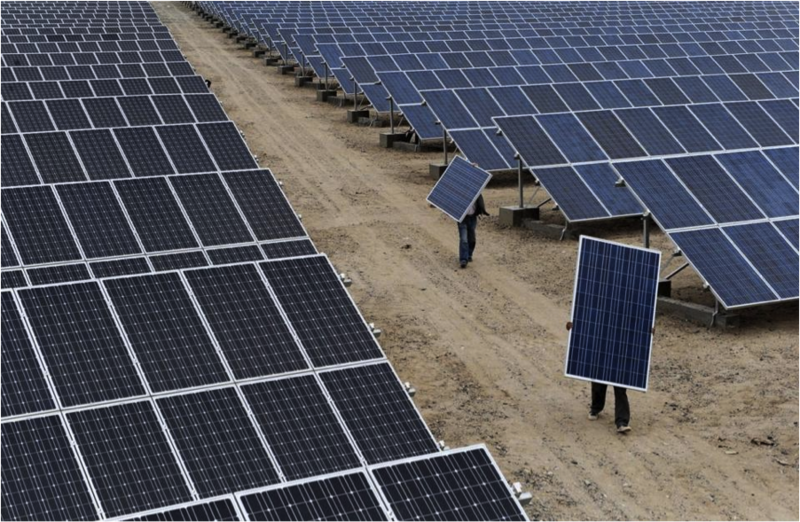 China’s solar panel industry is overcrowded! According to a recent New York Times article, while in this year the demand for solar panels is merely 4 to 5 gigawatts domestically, plus 18 to 19 gigawatts for export, Chinese companies have the ability to supply 50 gigawatts of solar panels. These statistics are astonishing—the supply of solar panels is double the demand! No doubt there is a fierce price war going on, and manufactures worldwide are suffering severely in this competition. That is only one part of the story. The Chinese government has almost ultimate control over its economy. In the field of solar panels, it is facing frustration. Presently, state-owned banks make loans to solar panel enterprises, while local and provincial governments subsidize the solar sector. I am not disagreeing with the government’s support of this industry. Of course, to development sustainably, renewable energy is on the right track. Nevertheless, this supportive movement can lead to increasing supply, which will further widen the gap between demand and supply. Now, an important question lies in how to make the industry run more economically. Keith Bradsher, the author of the New York Times piece, mentioned the solution offered by Lin Junfeng (a longtime director general at the National Development and Reform Commission)—just leave the industry to work it out on its own. I am skeptical about this approach. Firstly, if banks cut off loans to small businesses exclusively, this would lead to monopoly. We often link monopoly to a bad phenomenon because they block free access into the market and are hard to break up. This would also result in limitation of consumers’ choices. Secondly, if banks and local governments only support the strongest solar panel companies, they would easily fall into corruption. Most importantly, if they let the rest go bankrupt, what would happen to the workers at these firms? So, in order to make renewable energy economically sustainable, the whole society can help. First, producers should study supply and demand curves! Sometimes it is better to cut the production and wait for the price to rise. At the same time, the companies can research on how to lower the cost of solar panels. Secondly, the local governments cannot support these producers infinitely. Instead, they should support research in this field. This kind of support can be selective, and require quarterly or annual feedbacks to keep track of how research institutes conduct their research and how they use supportive money. Second, on the other side, why not support industrial users of solar panels? The third group is the state-owned banks. When issuing loans, they should be more cautious and not merely loan to the strongest companies. They should look into how the small companies function and whether they are promising. Last but not least, as individual consumers, we should support solar energy ourselves. We should use solar battery chargers and solar heaters. It is our responsibility to help our earth be clean and sustainable. 1 Response to What is Wrong with Our Renewable Energy?